Finally this photographer comes out of the shadow of his work, the darkness of his darkroom and into the light. Thomas Schmid was in Oslo December 2007 when I met him for the first time. And when do you ever meet a photographer with an old camera on a tripod and a cloth about the head? The answer probably is almost never…. That time he stood with his Linhof 9 x 12 from the 1930’s by the riverside of Akerselva in Oslo, Norway and took pictures while we talked about photography, the camera, techniques and choosing subjects, all themselves endless topics to discuss. He’s not only a fellow-countryman from Germany, but also an amazing photographer. Now, some years later parts of his photographical work are open to the public for the first time. The exhibition is open until July, 2nd and I recommend everyone who’s interested in photo and art to go and see it. “Light and shadow” is the title of the exhibition that includes 32 black and white photos. These impressive photos show nature- and city landscapes where not only light and shadow have important roles, but also the perspective. 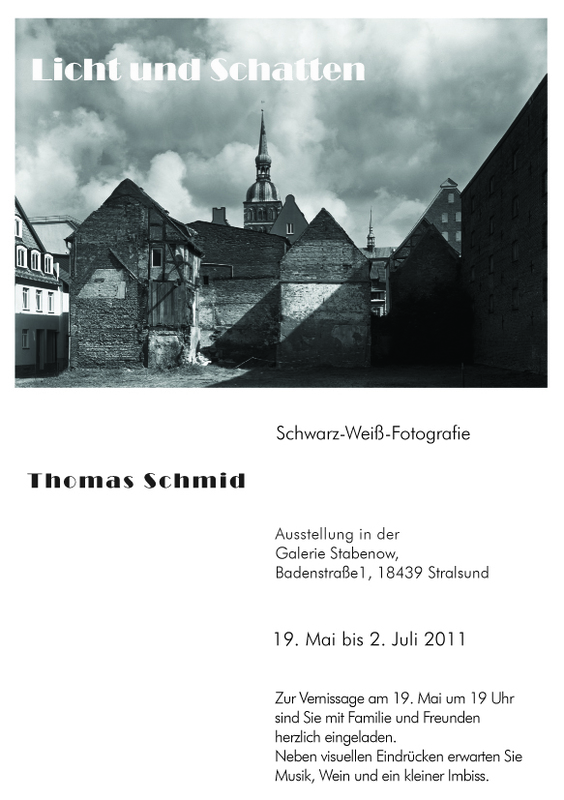 Schmid was born in Nürnberg, Germany but lives on the island Rugia. 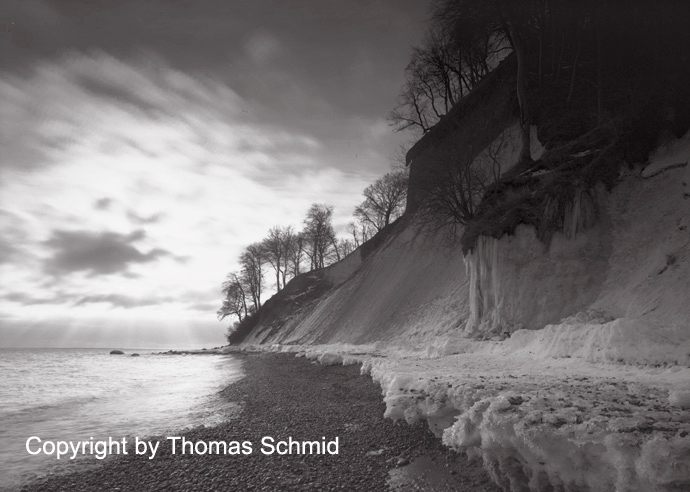 It’s, amongst other places, on this beautiful German island in the Baltic Sea that he finds his subjects. Subjects he binds with great knowledge and patience to the photographic plates. Pictures of landscapes where humans are absent, but at the same time they are affected by them. These impressive photos show nature- and city landscapes where not only light and shadow have an important part, but also the perspective. 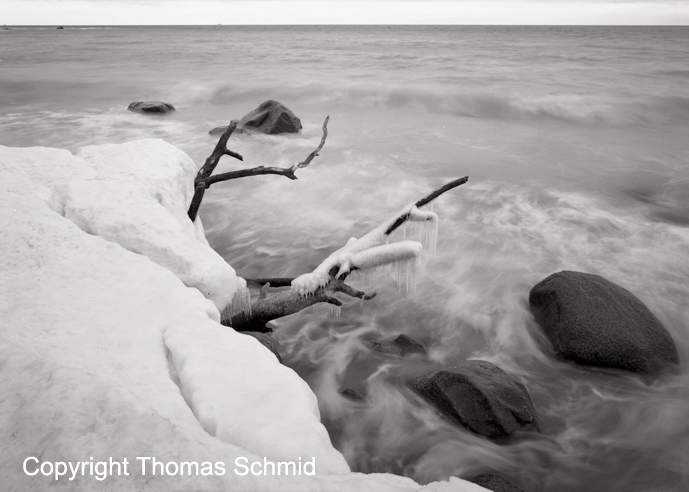 Thomas Schmid has in addition to the technical knowledge also an excellent eye for a subject. He invites his viewers along onto a journey in time were the time in his photos seem to stand still. This can be a fence in a snow-covered garden or the backside of houses where the walls show traces of houses being demolished. The photos are taken in with a fifty year old large format Linhof Technika camera. The photographer makes his own photographic plates and also develops his photos. There’s no memory card and printer. There’s precise, solid handwork carried on by great precision and empathy. Those who wonder how this is possible should plan a trip to Stralsund during their summer vacations.